New 4 Channel Dynam SU-26M Brushless Sports RC Plane 47" PNP (Blue). Dynam has provided us with another exciting aerobatic airplane once again. Introducing the new 47" SU-26M: despite of the mid-size design, the SU-26M is surprisingly lightweight, fast, and handles just like the larger version. It can do 3D flying and all kinds of aerobatics without concern, as it is powerful and durable thanks to the crash resistant EPO foam. The EPO foam can be easily repaired with epoxy glue in 5 minutes. 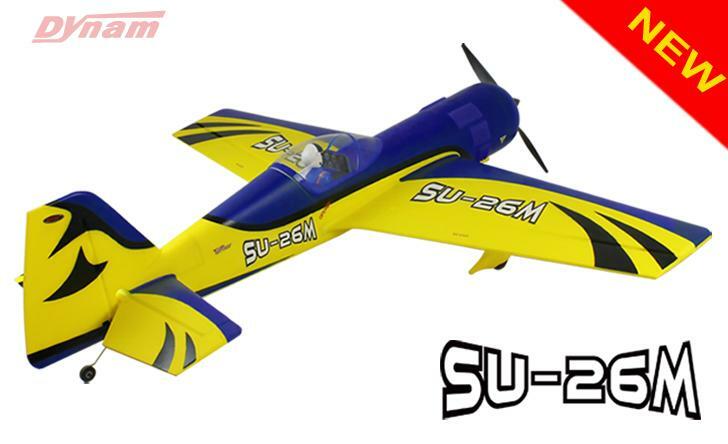 With its cutting edge and beautiful modern designs, SU-26M captures the attention of everyone who sees it up the sky. The PNP version comes equipped with a powerful Detrum BM3720-KV650 brushless motor matched with a 13x6 prop, a Detrum 50A brushless ESC, and 4 servos. With the included detailed assembly manual you can quickly get the SU-26M built and up in the sky.